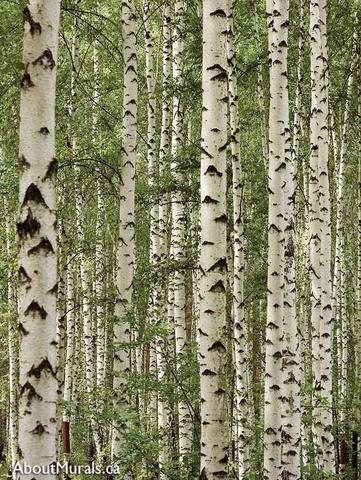 Ooh…my wall mural, Birch Tree Forest, was featured on TV! They talk about the mural around 3:58. The mural was hung behind some shelves and a cabinet in a laundry room. Shai took a boring room that was “nothing special” to a natural, pretty space with a connection to nature. CityLine host Tracy Moore and Shai DeLuca-Tamasi (founder of Shai DeLuca Interior Design) talked about a budget friendly laundry room makeover…for cottages. He picked this mural because he wanted to bring the natural surroundings of nature into the cottage. Mossy Green…Or Black And White! Shai used the full colour mural with organic, mossy greens but the mural is also available in black and white which gives a completely different look. 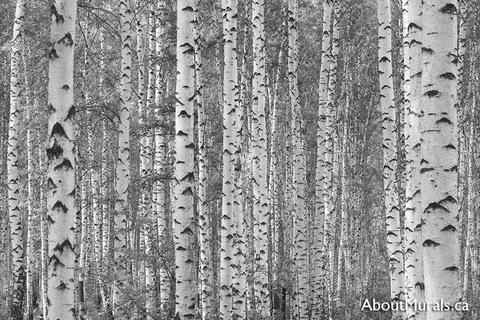 Do, do you like the mossy green Birch Tree Forest wall mural or the black and white Birch Tree wall mural version better? Do you think having the more natural, green look can only be used in a natural cottage setting…or do you think it would work just as well in a city home? Would love to hear your opinion about these wall murals in the comments below!